On Easter Monday 22nd April you have the chance to catch one of the GWSR ‘Easter Eggspress’ specials. Climb aboard a train at Cheltenham Race Course, Toddington or Broadway Station for this 'eggsellent' event which will be taking place at Winchcombe Station. As you travel through the beautiful Cotswold countryside, you can try one of the free children’s quiz sheets with Easter puzzles and games to make your journey even more enjoyable. Make sure you get off the train at Winchcombe as all of the free Easter activities are based there. 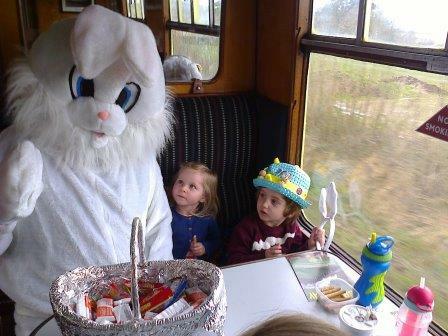 Look out for the Easter Bunny when you arrive on the platform! Don’t forget, if you’re wearing an Easter Bonnet that you’ve made, you have the chance to win a small prize for the ‘best bonnet on the train’. When you get off the train, go to the red telephone box to meet the judge. You can also join in the fun craft activities, making Easter cards and egg baskets, or your very own ‘bunny ears’. Try the popular temporary tattoo stickers, Easter colouring sheets, jigsaws and reading books, with a ball pool for the younger children. Take part in an Easter Egg Hunt around the station, with a small prize if you find them all, and Easter Games on the grass on Platform 2. Before you get back on the train to enjoy a ride along the line, don’t forget to sample the Easter treats on sale in the Coffee Pot Café. There’s no extra charge for any of the Easter activities; normal ticket prices apply for travelling on the trains. Come along to the GWSR on Easter Monday for a fun day out! You can save time on the day by buying your all-day rover ticket on-line in advance. Click on 'Book tickets now' below and change the calendar to April, then buy tickets for 22nd April.